Last year I submitted my Rosie Rhubarb recipe to Lynn Hill of The Clandestine Cake Club. 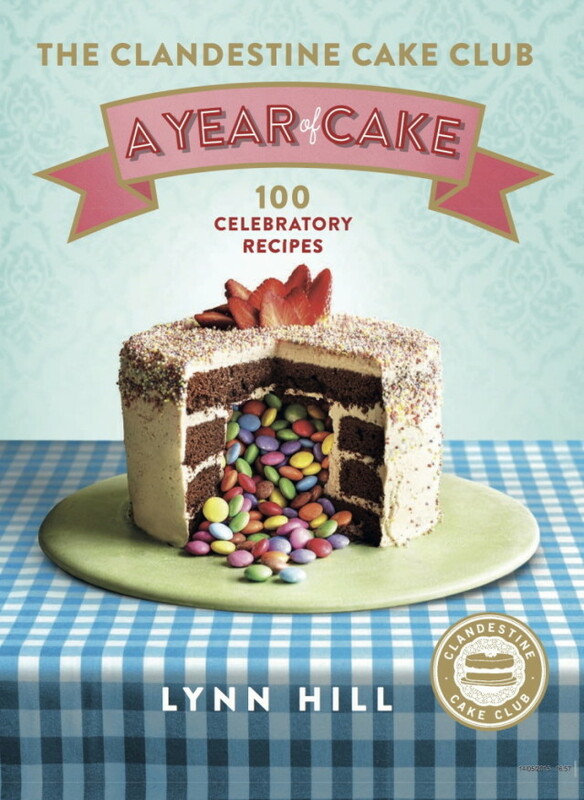 Lynn is publishing her second cake book in September and it will be called A Year of Cake and my recipe has been accepted and this is a picture of the front cover. It is going to be published on 10th September which is very exciting. Bake your way through the year with 100 celebratory recipes from Britain’s biggest cake club. Following the success of their first recipe collection, the Clandestine Cake Club is back with a second delicious helping. Inspired by the most cake-worthy moments throughout the year, founder Lynn Hill and her army of Cake Club members have compiled 100 gorgeous recipes to whet your appetite and get you celebrating. Arranged month by month, you’ll find cakes to suit all the best-known dates in the calendar – such as Christmas, Mother’s Day, Easter and Halloween – plus countless other occasions that deserve to be celebrated, from international holidays (Chinese New Year, Thanksgiving) and religious festivals (Diwali, Mardi Gras) to major sporting events (Wimbledon, the London Marathon) and the birthdays of iconic figures, including Shakespeare, Elvis Presley and the Queen – not forgetting the queen of baking, Mary Berry! Whether you fancy rocking out at Glastonbury, shaking your stuff at the Notting Hill Carnival, tapping your feet to the Last Night of the Proms, or smelling the roses at the Chelsea Flower Show, there’s a recipe here to get the party started. The cakes themselves hail from far and wide: some feel homegrown – such as Toffee Apple Gingerbread, Rhubarb Crumble & Custard Cake, and Strawberry Pimm’s Cake – while others promise a taste of the exotic – Chocolate Key Lime Cake, Persimmon, Yogurt & Pecan Cake, and Matcha Chiffon Cake. Club members love to innovate, offering up such temptations as Sea Salted Caramel Cake, Passionfruit Caipirinha Cake, and Canadian Maple Syrup & Bacon Cake. Each recipe is served up with a little slice of history, revealing the curious traditions behind the cakes and intriguing stories about the occasions that inspired them. Accompanied by gorgeously styled photographs, this book gives every cake-lover a reason to celebrate. Retired Yorkshirewoman Lynn Hill founded the Clandestine Cake Club in 2010, hosting its first gathering in a secret location in Leeds city centre. The club’s initial popularity led her to turn it into a ‘franchise’, encouraging others to host their own events under the Clandestine Cake Club banner. Takeup spread like wildfire and there are now over 200 affiliated clubs in the UK and abroad, with more registering every month. Lynn has been featured on The One Show, Lorraine, The Alan Titchmarsh Show and BBC Radio 4, as well as in The Times, Daily Mail, Grazia, Woman’s Own and the Huffington Post. She has appeared several times at The Cake and Bake Show. Lynn runs the club online via http://www.clandestinecakeclub.co.uk and Twitter, connecting daily with members, bakers and fellow cake lovers.